You decide. Is this luscious chocolate dessert a shortcake or a trifle? 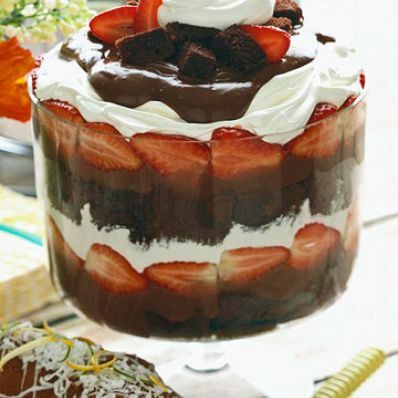 To make it, layer chocolate cake with chocolate pudding and strawberries in a bowl and top with whipped cream. 1 of 3 Cut cake into 1-1/2-inch squares. 2 of 3 Prepare pudding according to instructions. Cool completely with plastic wrap directly on surface. 3 of 3 Beat cream in bowl. When frothy, beat in sugar, 1 tablespoon at a time, and vanilla until soft peaks form. 1 of 2 On bottom of 15-cup glass bowl, arrange layer of cake squares, cut side down. Cover with third of pudding. Layer a third of sliced strawberries in decorative fashion. Top with third of whipped cream. Repeat layering two more times. Keep cream on final layer, 1-1/2 inches from edge of bowl so layer of berries underneath is visible. 2 of 2 Chill, covered, at least 3 hours, or overnight. Can be made up to 2 days ahead. Per Serving: 362 mg sodium, 351 kcal cal., 6 g pro., 10 g sat. fat, 2 g fiber, 42 g carb., 19 g Fat, total, 76 mg chol.